Zach Payne scored eight points to lead Kentucky to the bronze medal over Oregon. For the second day in a row, the Team Kentucky basketball and flag football teams had mirror image days. Both rebounded from disappointing first losses yesterday and both dominated their bronze medal games. Football jumped out to an early 12-0 lead on two long touchdown passes from EJ Johnson to James Jordan, both of which included impressive runs from Jordan. Idaho closed the lead to 12-6 at the half, but the second half was all Kentucky as the team pulled away for a 33-18 win. They finish with a 5-1 record at the USA Games. 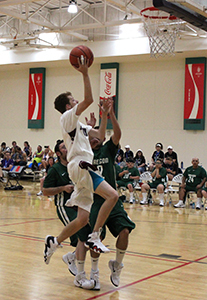 Basketball knocked off Oregon today for the bronze medal 38-22. It was Kentucky’s second win over Oregon in three days. Kentucky led 24-14 at halftime behind nine points from Ray Smith and eight from Zach Payne. Payne took over the second half adding four more to lead all scorers with 12. Chad McCarty and Dakota Duval each added five for Kentucky. Team Kentucky finishes the Tournament with a 4-1 record. Kentucky’s swimmers got into the medal action as well as Megan McCormick and Drew Janoski, both of Lexington, both medaled in their events today. McCormick finished her competition at the Games today with a silver medal in the 100-meter butterfly. She finished in 2:00.75. Janoski won a bronze medal in his heat of the 50-meter freestyle in 1:44.25. It was his first medal of the Games. In other swimming action, Hunter Eudy of Independence and Justin Hale of Louisville were placed in the same heat of the 50-meter freestyle. Eudy placed fifth in the race in :34.35,. He was less than two seconds behind silver medalist Ian Soules of Florida in a very close race. Hale, who won gold in the 100-meter freestyle yesterday placed seventh in the heat in a time of :35.55. Drew Janoski won his first medal of the Games today in the 50-meter freestyle. Kentucky gymnasts, who were the subjects of an ESPN2 feature during their Special Olympics broadcast tonight, continued to load up on medals on the last day of competition. Jennifer Rhein of Ludlow added two more gold medals to her already impressive haul. Rhein tied for the gold in the uneven bars, matching Illinois gymnast Tasjenay Feigh’s score of 18.70. Rhein stood atop the podium alone after the floor exercise, posting a score of 19.03, nearly 2.5 points better than Feigh. She closes the USA Games with four gold medals, including the all-around gold, and one silver. Tonya Cornett won gold in her division of the floor exercise with a score of 18.25, 1.5 ahead of Devon Anderson of Texas. She added a silver medal in the uneven bars with a score of 18.15, just .15 behind gold medalist Morgan Hulteen of New Jersey. She finishes her first USA Games with four gold medals, including the all-around gold, and one silver. Aliya White took silver in the uneven bars with a 17.73 score, finishing 1.7 points behind Krysta Perez of Florida. Her 17.75 was good for a bronze medal in the floor exercise. She was just .23 points behind silver medalist Mia Crump of Texas and 1.1 behind gold medalist Perez. White, the youngest Team Kentucky athlete at these Games, finishes with a gold, two silvers, a bronze and a fourth place in her first USA Games. 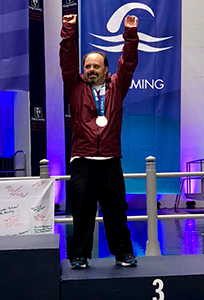 Lee Dockins closed out the gymnastics competition with two more gold medals today at the Special Olympics USA Games in Seattle, Wash. Dockins won gold in the uneven bars with a score of 16.73, two points ahead of silver medalist Samantha Berndt of Massachusetts. Her 18.78 in the floor exercise won her gold in that event as well, this time by 1.25 points over Berndt. She closes the USA Games with three gold medals, including the all-around, and a pair of silver medals. Danielle Blakeney of Erlanger took home a silver medal in the uneven bars today. She posted a score of 18.15, finishing just .33 points behind gold medalist Madeline Csont of New York. She also grabbed a fourth place ribbon in the floor exercise, finishing with a score of 16.85. She was just .35 points behind bronze medalist Kellie O’Donnell of Illinois and .64 behind silver medalist Samantha Berndt of Massachusetts. Kentucky’s Lee Dockins won the gold. Blakeney finishes with one silver and one bronze medal, two fourth place ribbons and a sixth place. This was Balekeney’s first major competition since moving up to a Level 3 gymnast. In Team Kentucky’s only track action, Caitlin Roy of Louisville finished fourth in her heat of the 400-meter run. She finished in a time of 1:26.84. Rebecca St. Remy of Florida claimed the gold in Roy’s heat. Roy ends the games with a gold and a silver medal to go with the fourth place ribbon. The Games come to a close tomorrow but not until after Team Kentucky gets in its final competitions. Swimmers Eudy, Hale and Janoski each have one more race. They will all be swimming the 50-meter backstroke. Kate Nason will run the 1,500 meters first thing tomorrow morning. She claimed a silver medal in the 3,000 meters on Tuesday. Team Kentucky will head to the Closing Ceremonies tomorrow evening at Lake Union Park.